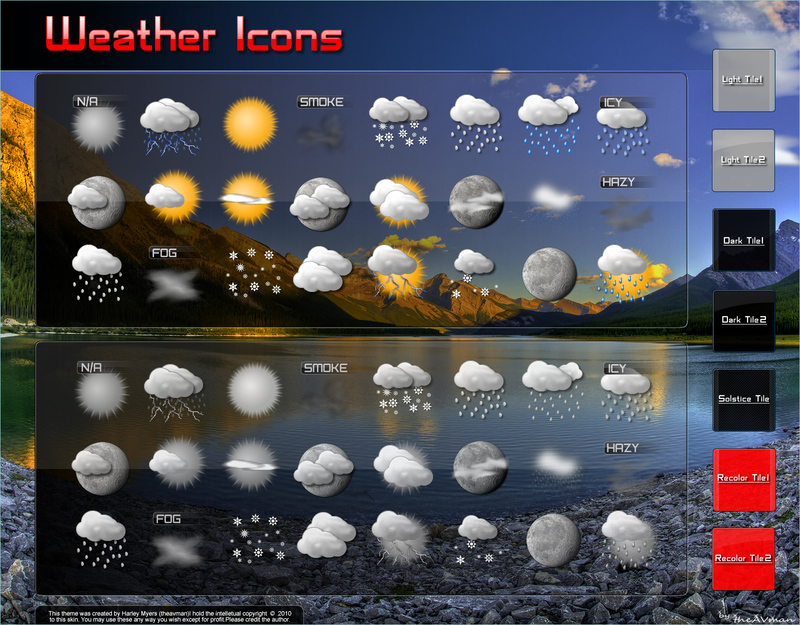 This set of icons was designed to be used with weather widgets and gadgets.There are 54 icons total. 2 sets of 27 icons the first is normal with color the second is a color free set.There are also 7 tiles in the zip which if you like playing in your art program you can drop in behind the icons before importing them into your widget(gadget)2 light 2 dark 2 red (best color to apply a hue shift to) and 1 to match an uncoming windowblind. Thanks Harley!! Just used some of your icons in a new weather widget!! Just saw it,Very nice BTW ! Thanks man! Damn Harley! These look awesome! Thank you Steve I appreciate it !!! !